As for many tools–an easy guess if you are familiar with the craft or trade. Summer Solstice. It was still cloudy at 5:17 and leafy trees hide the horizon, but I caught a few pink cloud reflections from the northeast. 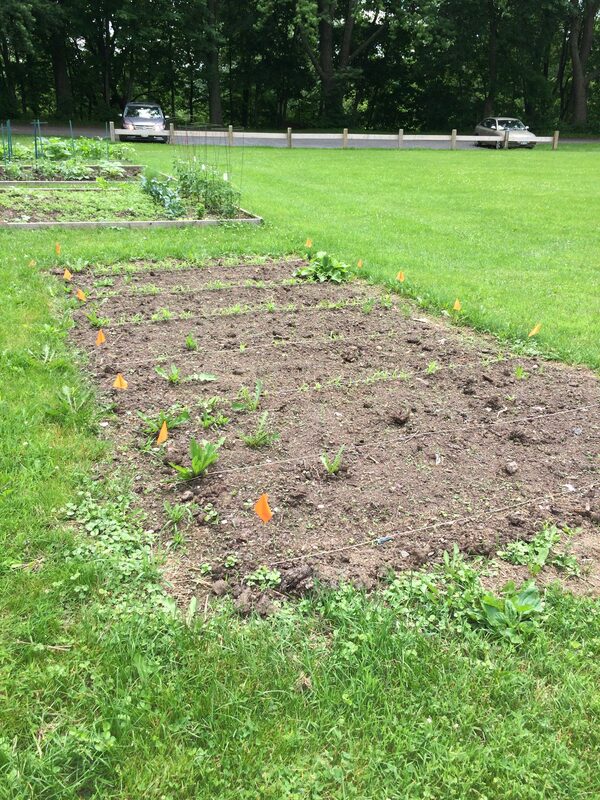 This year’s crops starting to come up–broomcorn and some hollyhocks. And a few weeds to tackle tomorrow. 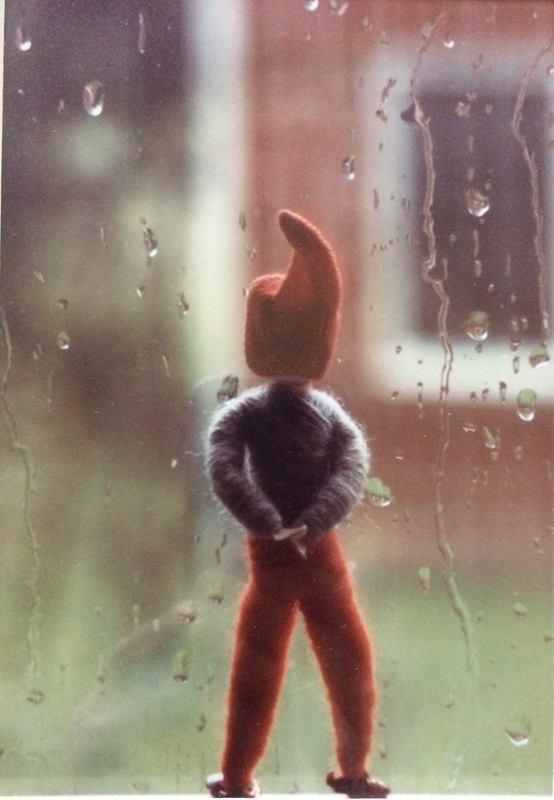 One of Lillian Flint’s elves reflecting on the spring weather we’ve had this year! Whether you’ve been to the Village Wide Garage Sale or at some other event on Saturday, stop by the Flint House for a fun and relaxing end to your day. Grab a blanket or chairs. Bring a picnic from home, or stop by one of our village restaurants and pick something up. We’ll have three beverage choices. Wolf Hollow Brewing Company is bringing 3 varieties for tasting and purchase–Wolf Hollow Amber, an American Amber Ale; District 6 IPA, a West Coast Style IPA; and Brunette’s Revenge, a Dry Hopped Wheat Beer. Don’t forget to bring your ID! Wolf Hollow will be serving from 4 until 6:30 (or later). Electric City Roasters will have a selection of their locally-roasted coffees. You may be familiar with their great products from the Schenectady Greenmarket. You’ll be able to taste a variety of coffees and purchase coffee by the cup. They will also be selling coffee beans to take home. They will be here from 4-6:30. Soda and bottled water will be available for a small donation. For dessert, free Stewarts ice cream sundaes will be available! Service starts at 6 and continues until we run out. From 4-6 there will be tours of the Flint House. If you’ve never been inside, here is your chance to see what is in here and find out the interesting story of the building. Barbara Bennett will have a craft table for the kids with a Flag Day/July 4 craft. Dr. Steve Jones will be talking about the archaeology that has been done at the Flint House and has on display some of the interesting items found underground around the house. Deborah Angilletta will be painting outdoors. She recently had an exhibit at the Mabee Farm of plein air work she did over there last year. She’ll bring some items to display, and would be happy to talk to you about the pleasures of painting outside the studio. 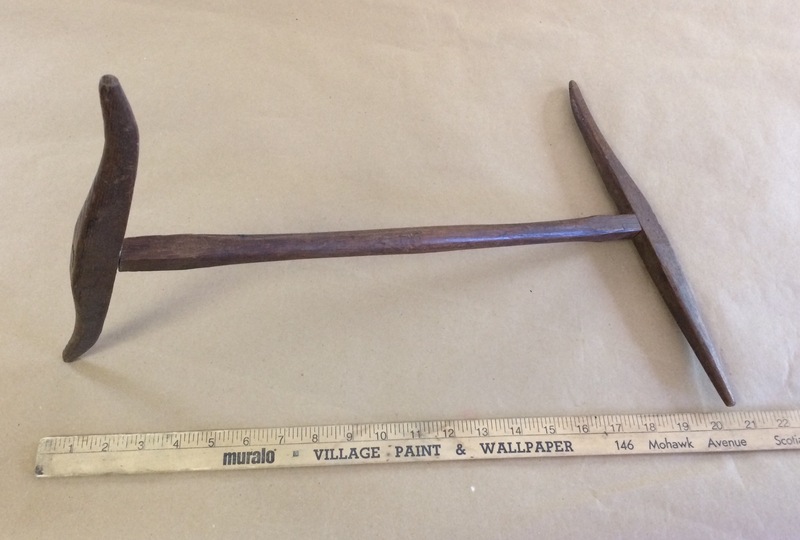 The Scotia Fire Department will bring over the antique hand pumper, also from 4-6. When the Neptune Engine Company (precursor of today’s SFD) was formed in 1873, they purchased two used hand-drawn engines. This one is “Old Neptune #4,” an 1830 pumper built by W.E. Worth & Son of Albany and contains a 200-gallon water tank. Come check it out! Scotia is one of the few really walkable villages around, so I encourage you to take a walk! The small street in front of the Flint House will be closed during the event. Some parking will be available, and we are saving some of those places (near the dog park parking area) for people with handicapped placards. There will be a drop-off zone at the end of Reynolds Street as well, so a driver can pull around, let folks out, and then go back out for regular street parking. There are also porta-potties for your convenience. In the first half of the 19th century, before public parks were common, entrepreneurs would open pleasure gardens where visitors could stroll among the trees and flowers, enjoy various entertainments, have refreshments, and listen to music. 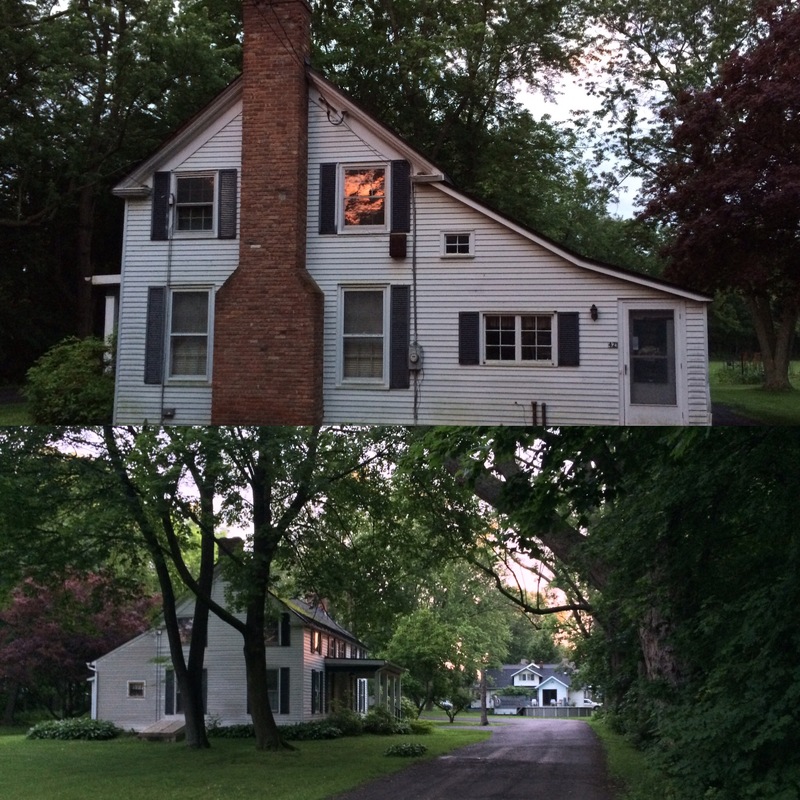 In the spirit of those days, from 6:30 to 7:30 the Musicians of Ma’alwyck will set up under the tent and present a concert of music from the early 1800s, a time when Scotia was still a small rural community and the Flint House, then the Reese homestead, was new. You can sit and enjoy the music, enjoy your picnic or a beverage while you listen, or even stroll around during the show. There are lively antics to go along with the tunes, and kids are very welcome! Bring a chair or blanket if you can, as we have a limited number of seats. There will be a performance of an 1817 vaudeville by Carl Blum called The Ship’s Captain, arranged for these instruments by J.H.C. Bornhardt. A vaudeville is a one-act musical—the story is told with a series of songs. The lyrics were set to familiar tunes that the Germans of 1817 would certainly have recognized! You might also recognize a few yourself. The Musicians recently found the lyrics to the songs in the Sibley Library at Eastman School of Music and translated them just in time for this performance. The Pic-Nic Quadrilles by Philip Ernst (1792-1868), is a set of short instrumental pieces that were published in New York in 1843. Ernst was born in Mainz and immigrated to America during the 1830s. He played first flute in the New York Philharmonic when it was founded in 1842. A quadrille is a European dance for four couples, popular in the 1800s both there and in America– and who could resist this title for an outdoor show! There are also two Civil War period songs (“If I Only Had a Moustache” is one of them); “Coming Through the Rye,” which Jenny Lind sang on tour in Albany in 1851; and an opera aria from Rossini’s The Italian Girl in Algiers. The Musicians of Ma’alwyck, founded in 1999, are in residence at the Schuyler Mansion State Historic Site in Albany (the home of General Philip Schuyler, Revolutionary War leader and father-in-law of Alexander Hamilton) and Schenectady County Community College. Violinist and Director Ann-Marie Barker Schwartz is joined by guitarist Sten Isachsen, flutist Norman Thibodeau, soprano Tess McCarthy and baritone Charles Schwartz.